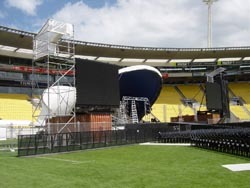 The setup for the WWE SmackDown Road to WrestleMania 22 tour event at Westpac Stadium is coming together very well. 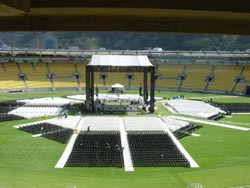 NZPWI Editor Dion McCracken toured the Stadium today, and believes fans are in for one incredible evening. Weather in Wellington was partly cloudy and hot today, with Stadium Manager Steve Thompson confident that the weather would hold out. McCracken says that fans are going to be blown away. Tickets for the WWE SmackDown Road to Wrestlemania 22 tour are still available from Ticketek. Next story Road to WrestleMania to be released on DVD?